Gabriel Brenner, the man behind Argentine fashion brands such as María Cher and A.Y. 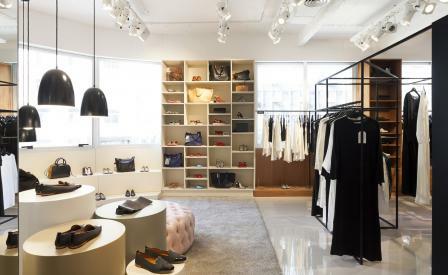 Not Dead, has now unveiled Editor Market, a chic concept store housed in a Rationalist building in downtown Buenos Aires. Under the leadership of creative director and interior designer, Coty Larguía, the outlet has fast become the city’s hippest lifestyle hub, offering la crème de la crème of Argentine talent. Brenner enlisted mother and daughter duo, architects Irene Joselevich and Ana Rascovsky, to transform the eight-floor building into a series of light-filled rooms, each with an individual appearance. ‘We want our customers to meander around and be able to discover something new in every corner,’ says Larguía, who was influenced by major players such as Dover Street Market and Paris’ Merci. Larguía’s carefully curated brands include lighting by Federico Churba, bicycles from Monochrome and Fueguía’s perfumes and candles, while the fashion, jewellery, shoes and accessories were strictly the domain of art director Silvana Grosso, who chose a mix of top labels such as Ramírez and Tramando to sit alongside lesser known local names from Boerr- Yarde Buller to Manto.